Cleveland's 20-year-old phenom, Kyrie Irving, has taken the league by storm this season. Before he single-handedly stole Wednesday's game from New Orleans, Irving ranked sixth in the NBA with 23.5 points per game, outscoring big names such as Dwyane Wade and Russell Westbrook. During All-Star Weekend, Bleacher Report mentioned Reggie Miller's praise for the first time All-Star. Miller claimed that the former Duke standout was already the most skilled point guard in the NBA, and referenced the fact that his ball-handling is on-par with Chris Paul's. For those who need visual evidence, check out Kyrie dropping an ankle breaker on fellow NBA sophomore, Brandon Knight, in the BBVA Rising Stars Game. After watching the highlights and listening to all the praise over the young point guard's handle, we decided to inquire further about his tendencies with a recent SnapCall. The SnapCall results demonstrated that the young Cavalier favored his left ever-so slightly. However, the real tendencies come into play when we break down each drive. On his three drives to the left, Kyrie blew by his defender each time with pure speed. Two of those drives resulted in him drawing an extra defender and kicking the ball out to the perimeter for an assist. The other drive to the left led to a step-back jumper, which clanked hard off the rim. On his two drives to the right, he was able to create offense for himself. The first time he was matched up against the defensively-inept Austin Rivers. He crossed the young Hornet over and was able to finish for an easy layup. The other slash to the rim ended with a smooth five-foot floater that hit nothing but net. While Irving is most definitely a nightmare to defend in a one-on-one situation, when going left he seems to lack the aggressiveness to take it all the way to the rim and finish. Defenders who force him in left may see slightly better results than those who try to play him straight-up. 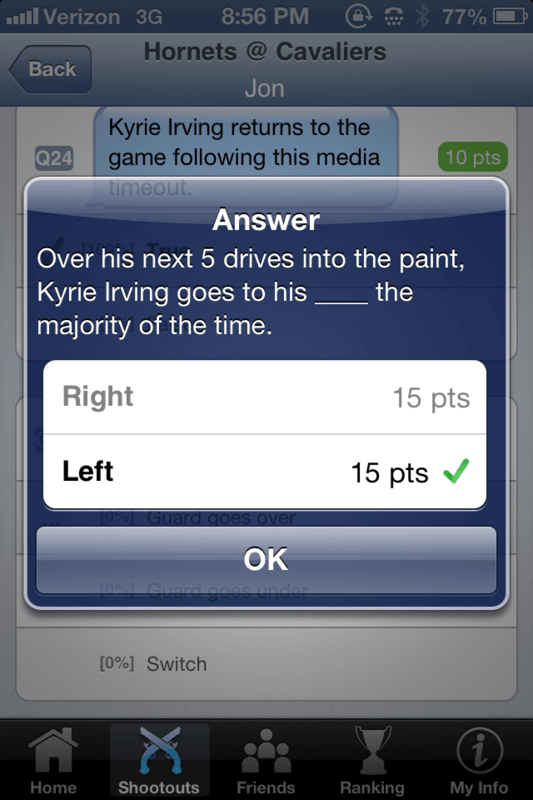 Tune in next time SnapCall covers the Cleveland Cavaliers to prove that you're more prepared to answer our questions than any of your friends.